The TW-10916 is a veneered panel door which uses a 7/16″ thick veneered center panel to give the door a heavier feel than the simple 1/4″ thick veneer panel doors. 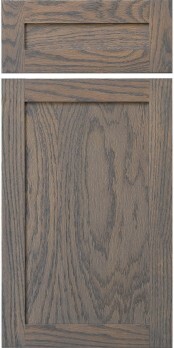 It is important to note that the drop from the framing to the panel face is shallower on this door than a standard door (1/8″ drop instead of 3/8″). Door uses ‘Tudor’ framing where the face of the door’s frame is narrower than the back. Any framing dimensions are as measured from the back of the door. As a result, the face of the door only has 1-15/16″ wide framing instead of 2-1/4″ as with our ‘normal’ mortise and tenon doors.